Webster's Dictionary defines "adopt" as "to take by choice into a relationship" or "to sponsor the care and maintenance of." It is a wonderful concept that God has used to describe His relationship with those who trust Him. He has taken us by His own choice; He is committed to our care and maintenance. What a glorious truth! We're looking for a few good people or families to do a Prayer Adoption of an evangelist and his family. This means a commitment to pray regularly for the needs of the evangelist. What needs? Usually we think first of their financial needs, but this Prayer Adoption includes praying for wisdom, for strength, for protection from the Evil One, for their children and their marriages, for health, for spiritual courage, for their working relationship with the church leaders, for God's blessing upon their ministries, for their joy in the Lord, for fortitude and diligence. As you can see, it is much broader than mere financial issues....it is about eternal, spiritual issues that impact the Kingdom of God in Ethiopia. How you live out your commitment is dependent upon how the Holy Spirit guides you. Perhaps you include your evangelist in your bedtime prayer routine, or you have a once-a-month prayer and fasting day for him, or you remember him Mon/Wed/Fri in your family devotions. The point is to listen to the Spirit, and follow His guidance. He knows exactly what is happening in the life of the evangelist and his family....and He will impress you what to pray for and when. But I encourage you....when you think of the evangelist, don't just think about him....bring him before the Throne. Do the hard work of intercession on his behalf! Would you like to be involved? Discuss it with your family and then contact us at dblack@sebts.edu. Tell us a little about your family....where you live, number of kids, type of work, special things. It would be wonderful for you to attach a picture of your family as well. We will match you with an evangelist as the Lord leads us, and send you pictures and bio of him. We'll "introduce" you via email, and then we'll let you know what's happening with your evangelist periodically via email updates. Prayer is the most powerful tool we have as believers. It takes us directly to the Throne Room of God by the power of the blood of Jesus. We have no fear there...we have only the open heart of our precious God. He delights to move on earth according to the petitions of His children. 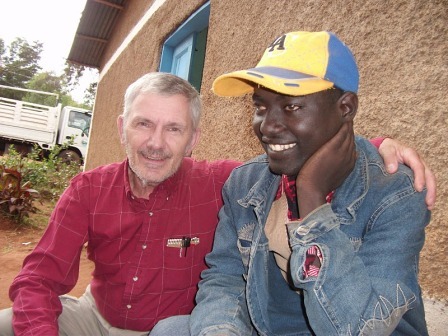 Let us use this privilege for the good of these brethren in Ethiopia!